It’s now nine wins and one draw from 10 games in charge of Manchester United for Ole Gunnar Solskjaer, after the Norwegian’s charges held on for a narrow victory over Leicester City at the King Power Stadium. The Red Devils were ahead within the opening 10 minutes, as Paul Pogba took advantage of sloppiness in the home ranks to play a delightful ball into Marcus Rashford – the 21-year-old finished with the confidence of a man who now has six goals in nine league games since Solskjaer took the reins. The Foxes, fresh from an excellent point at Liverpool in midweek, carried a threat throughout, and David de Gea had to be at his best to keep out Jamie Vardy and substitute Rachid Ghezzal. United held on, however, and with the three points moved up to fifth in the Premier League table. 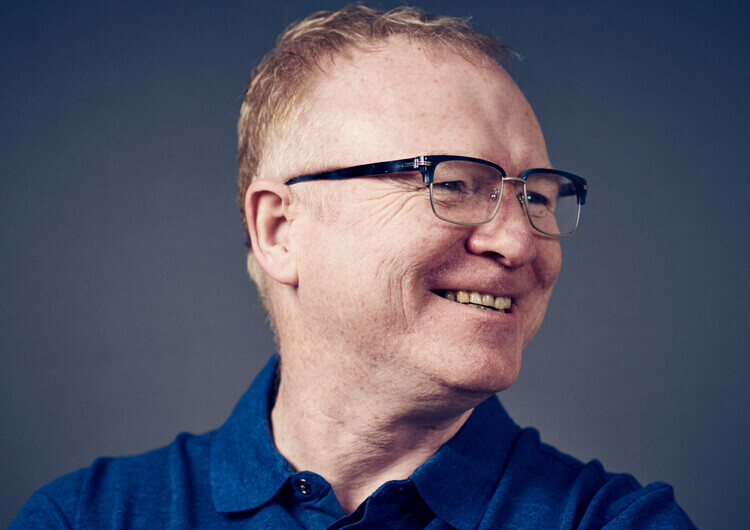 Leicester set up in a 4-2-3-1 formation, with Wilfred Ndidi and Nampalys Mendy as the deep central midfielders behind an attacking midfield trio of Demarai Gray, James Maddison and Harvey Barnes. Jamie Vardy started as the lone central striker. The hosts tried to stretch Manchester United horizontally, through the positioning of their full-backs and attacking midfielders. Often the width would be provided by Ben Chilwell and Ricardo Pereira, with Gray and Barnes playing more inside; Ndidi and Mendy would always remain deep to provide protection for Harry Maguire and Jonny Evans, should Leicester lose possession. 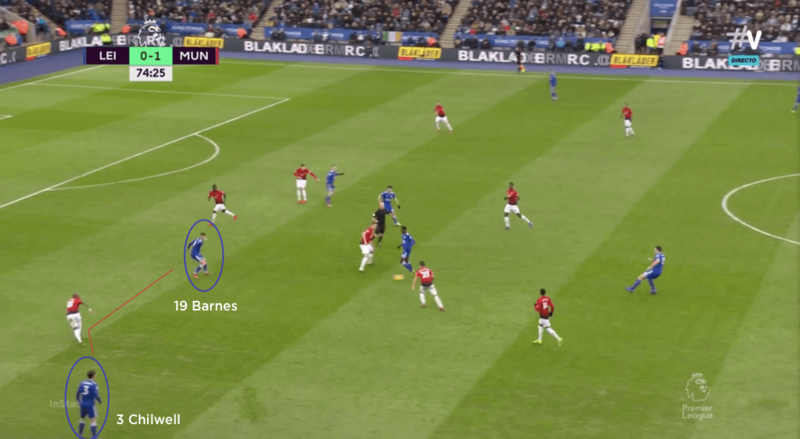 The idea was for Gray and Barnes to occupy the United full-backs and create space for their own full-backs to get on the ball in advanced areas – particularly as the visiting wide attackers were often caught high up the pitch. 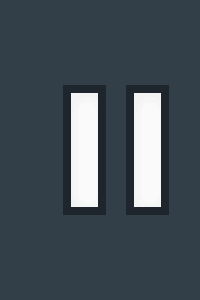 This would give Ashley Young and Luke Shaw a problem: did they stay with the man inside and leave the full-back free outside, or move towards their opposite number but leave the man inside? If Leicester couldn’t get their full-backs up the pitch, then they would look to use Maddison as a second striker to play against the United full-back and in effect create the same problem. Beyond this, the hosts tended to look to their better dribblers to try to create opportunities, rather than using any sort of combination play to unlock United. A lack of quality in the penalty box meant that Leicester failed to capitalise on a number of reasonably good chances, however. 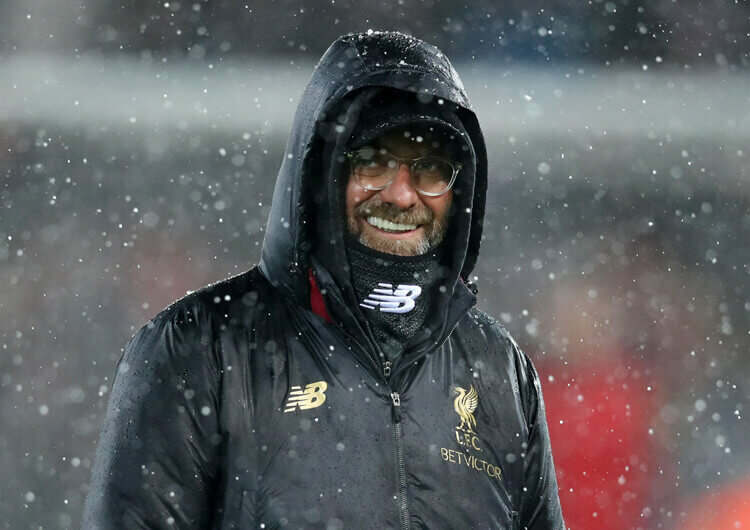 Manager Claude Puel will have been frustrated at his side’s inability to find the net after such an encouraging display at Anfield only four days earlier. Out of possession, Leicester varied between a number of formations: 4-4-2, 4-4-1-1 and 4-5-1. 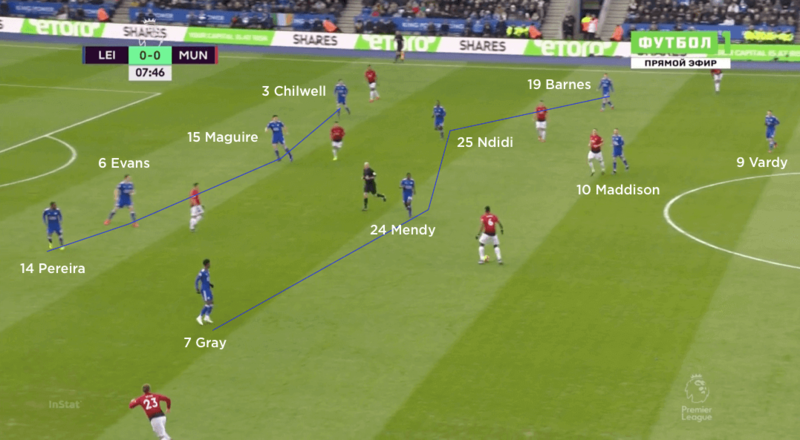 When pressing United high, Vardy and Maddison would lead the press; Gray and Barnes would tuck inside and try to screen the pass to the full-backs, while Ndidi and Mendy would try to affect the United central midfielders. 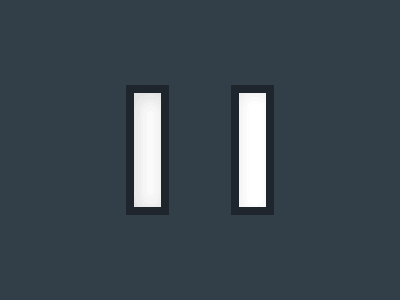 The hosts used a mid-block more than the high press, however. This improved their defensive solidity, but left them vulnerable if the wrong player went. If Vardy tried to affect the United centre-backs, for example, then Maddison would be left to track Nemanja Matic and Ander Herrera. The issue here was that when Maddison went to press one of the United midfielders, the other would be left free; this would in turn draw out one of Ndidi or Mendy, leaving one of United’s attacking midfielders free to receive between the lines. This was dangerous for the Foxes, as the threat of Marcus Rashford in behind meant their centre-backs couldn’t move up to cover the space. When Leicester used Vardy and Maddison to press Herrera and Matic between them, they looked much more solid. This meant that Eric Bailly and Victor Lindelof were left free in possession, but not in an area that would cause any real threat. It also left Ndidi and Mendy to deal with the dangerous Paul Pogba, and any United player looking to drop between the lines. Leicester set up in a 4-2-3-1, with Wilfred Ndidi and Nampalys Mendy sitting deep in midfield. Full-backs Ben Chilwell and Ricardo Pereira would try to get forward to support the attacking midfielders as much as possible. The Foxes took up a number of formations out of possession, including the 4-4-1-1 pictured here – James Maddison supported Jamie Vardy on the top line, while Demarai Gray and Harvey Barnes dropped into a midfield four. 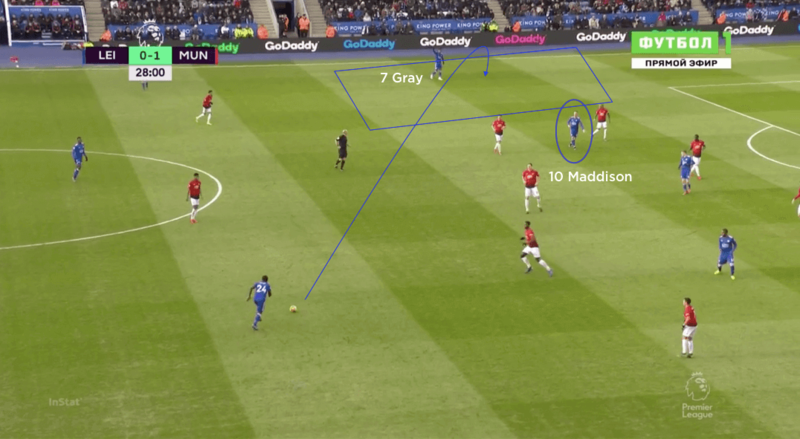 Using Maddison as a second striker enabled Leicester to engage the Manchester United full-backs – here Ashley Young – and create more space to attack in wide areas. 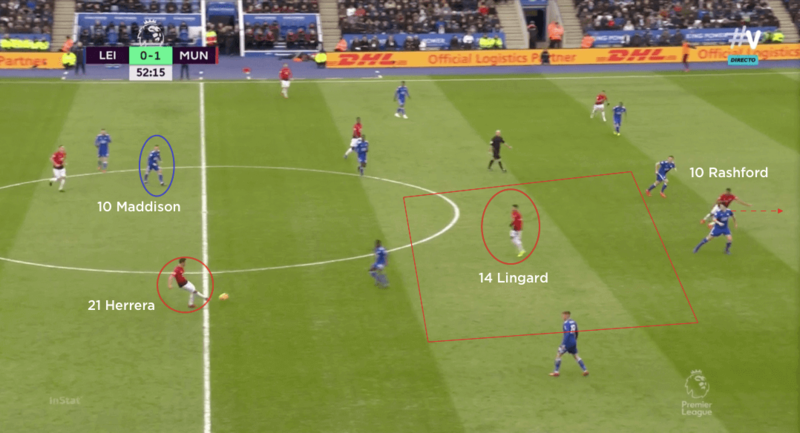 Similarly, pushing the full-backs high gave the United full-backs a problem – did they follow their man inside, stay wide to mark the full-back or position themselves in a bid to cover both? Manchester United set up in a 4-3-3 formation, with Marcus Rashford, Alexis Sanchez and Jesse Lingard in a fluid front three. Full-backs Ashley Young and Luke Shaw provided the attacking width. Out of possession, the visitors dropped into a 4-5-1 when Leicester advanced up the pitch. 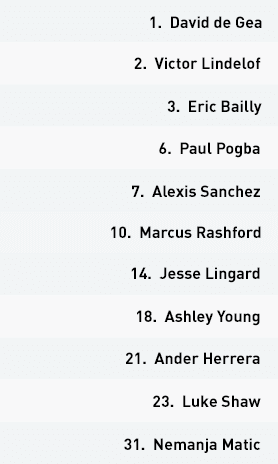 The wide attackers – here Rashford and Sanchez – would track back to cover the home full-backs.  United would look to create midfield overloads in a bid to drag Leicester players out of their shape – this then allowed for quick switches to attackers in space on the opposite side. James Maddison would often have to mark both Nemanja Matic and Ander Herrera in the United midfield. 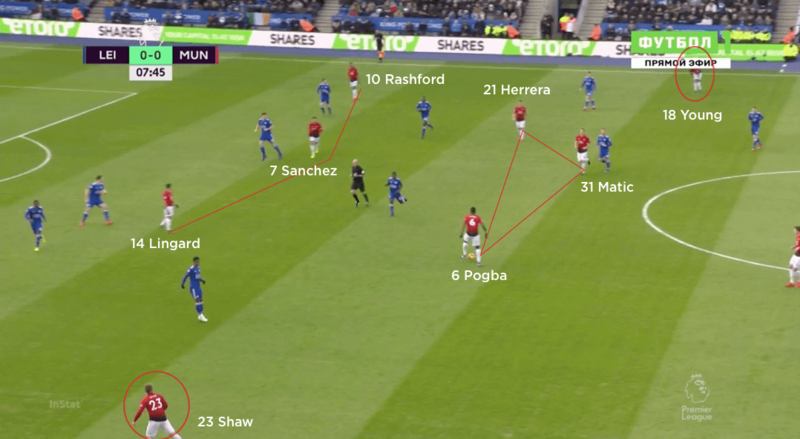 Whichever was free would then draw the deeper Leicester midfielders out, creating space between the lines for the United attackers – particularly as the centre-backs stayed deep to deal with the threat of Rashford in behind. Ole Gunnar Solskjaer set Manchester United up in a 4-3-3 formation, with Nemanja Matic, Ander Herrera and Paul Pogba as a midfield trio behind a fluid front three of Jesse Lingard, Alexis Sanchez and Marcus Rashford. 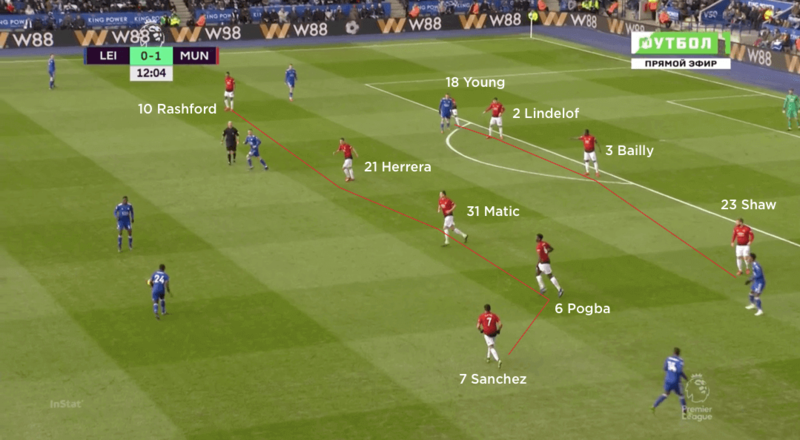 The visitors looked to create overloads in dangerous areas, regularly using Lingard and Sanchez to drop in between the lines and join Pogba, Matic and Herrera against the Leicester midfield. As the hosts employed more men to deal with the overload, United could create space away from the ball and look to switch at speed. 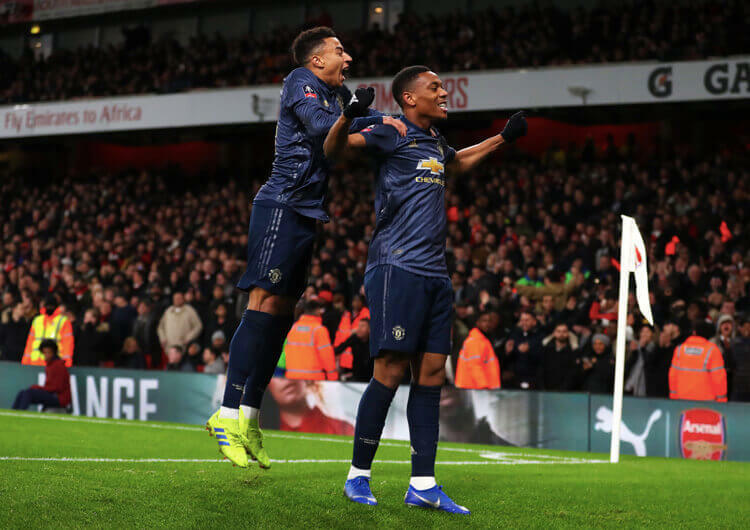 The width would usually be provided by full-backs Ashley Young and Luke Shaw, but United also used their wide attackers out there as well, making the route to the switch less crowded. When using Lingard and Sanchez to drop in between the lines, Rashford would try to stretch the play vertically by threatening with runs in behind. This often kept both Harry Maguire and Jonny Evans busy, which increased the space between the lines for United’s attackers to receive, turn and play forwards. Out of possession, United switched between a 4-4-2 and a 4-5-1, depending on where the ball was. 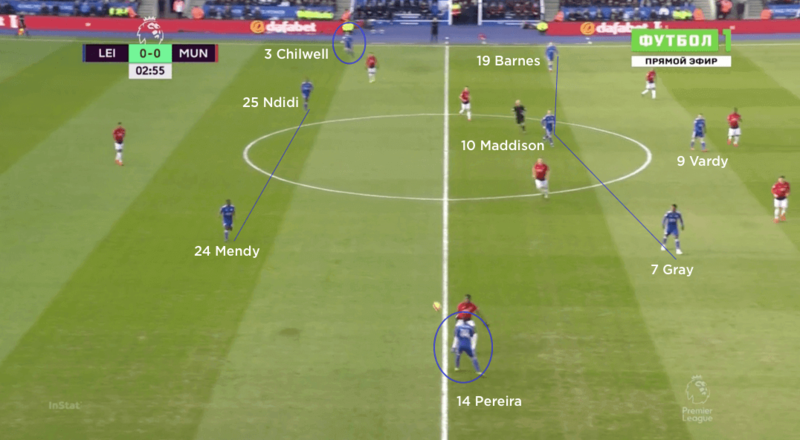 In Leicester’s half, and when pressing from their goal-kicks, United would set up in a 4-4-2 but make it very clear which side Leicester should play to; one of the front two would stay central while the other moved to one side of the pitch. As the ball went to the free side, United would push across and show Leicester wide. As the ball moved further up the pitch, United tended to use their wide attackers to occupy the Leicester full-backs. 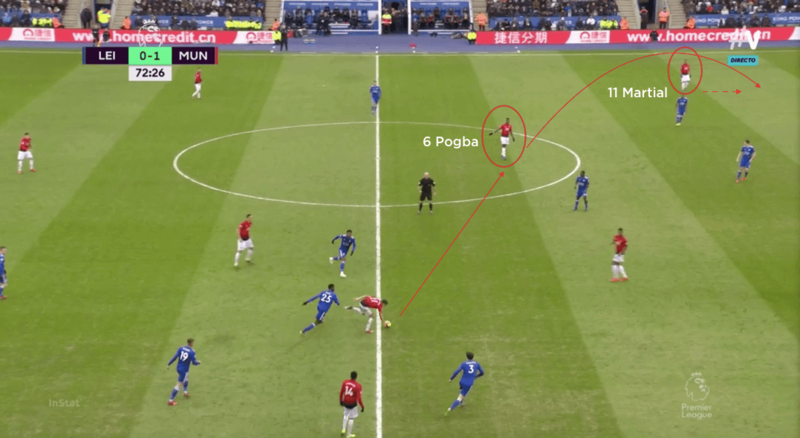 This reduced the chances of Leicester creating two-on-ones against the United full-backs and still allowed them to defend with four across midfield – the player who had formed the front two in a wider position in the initial press would simply drop back into a midfield position. When the wide attacker – usually Sanchez or Lingard, but sometimes Rashford – wasn’t able to track back with his full-back, the United full-back would go out to engage him while the nearest central midfielder covered inside. 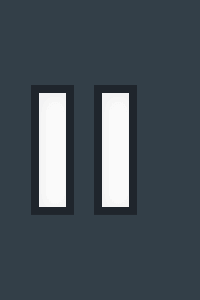 It wasn’t a perfect defensive display, but that is now three away clean sheets in succession in the Premier League – a statistic Solskjaer will be very happy with as he maintains his unbeaten start.